HALF DAY TRIPS RANGE IN PRICE FROM MMK 35,000 TO 50,000. PRICE IS ALL-INCLUSIVE. * Note that half day options could potentially be partnered with another half-day activity to make for a full day of adventure. Also, some of the half day trips can be extended for a longer adventure in the same location. Perhaps you're arriving by bus in the morning and want to do something in the afternoon, or you're flying out in the afternoon, and a half day adventure is exactly what you need. 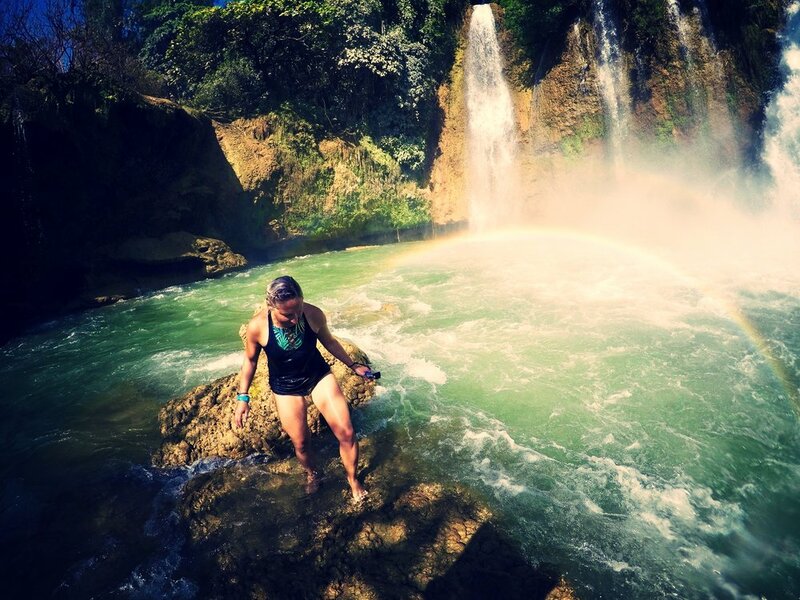 We will provide the transportation, the guide, one homemade meal, snacks, and show you all the secrets of a multi-tiered waterfall to climb and swim through, all in a very full 6 hours. Dark Horse Falls is in a small town near Lashio. It is an idyllic small town that has a main area that everyone congregates during the morning and evening. Upon arrival, you'll notice the life of the people in the town on display, their joy, the simplicity of their way of life in their riverside village, which sits on the banks of the Nam Yao River. 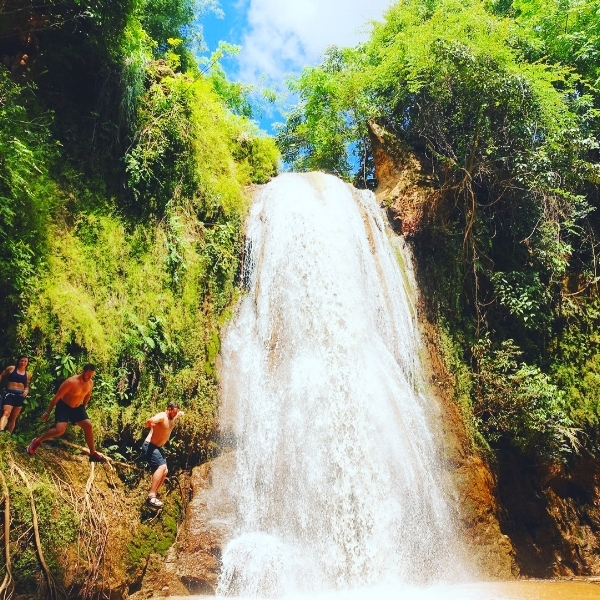 It is a multi-tiered waterfall with lots of places to explore and swim, if you're willing to take the plunge! From the village we head outside of town until a trailhead appears which dives down into the valley, where you'll arrive at the bottom of the falls, where you can see, just barely, the magnificence of the falls. Getting a closer look is all but imperative, and that is how the adventure begins. Don't worry though, we will take care of you. Our guides have been trained, are cautious, and will ensure you are safe while at the same time gauging your level of comfort with exploration. The more you take the cues from our guides, the fuller your experience will be...safely of course! Standup Paddleboarding is an emerging sport that takes on many forms, from lakes to rivers to oceans, from relaxation to exercise to competition. There are a few lakes in Lashio, fed by small local streams that find their source in the mountains. On one of these lakes, we take the truck and paddle boards out and down windy bumpy dirt roads to get to the lake, where we put into the water for a mostly relaxing paddle on a typically glassy lake. For beginners, we will help you get your balance on the board, teach you the correct way to paddle, and soon you'll be up on your feet. We will then explore the different arms of the lake. When you're hot or tired, just hop in for a swim. There are a couple places to jump in from the rocky bamboo shores off small cliffs. We can take our time, or get some exercise. A half day is enough time to explore, to relax, to get exercise, and to go for a swim. Morning trips will be back in Lashio for a late lunch. Afternoon trips will meet back in Lashio for a home-cooked meal. We will provide snacks and water for your trip as well. Hidden Tiger Falls is tucked in a remote jungle valley in the middle of nowhere, or so it feels like. To get there, we ride 125cc geared scooters or motorbikes over the mountains, through Chinese, Kachin, Wa, Shan, Lahu, and Lisu villages until we get to the trailhead in a small off-grid village. The hike is short but very steep as we descend into a deep valley, and then we make our way in swimming attire through a stairway of waterfalls until we get to the big waterfall, at which point it is too unsafe to keep climbing. The motorcycle ride in itself is a good adventure, but the waterfall is a favorite of the few we've taken so far, as it is in a ecologically diverse valley with interesting natural beauty everywhere you look. 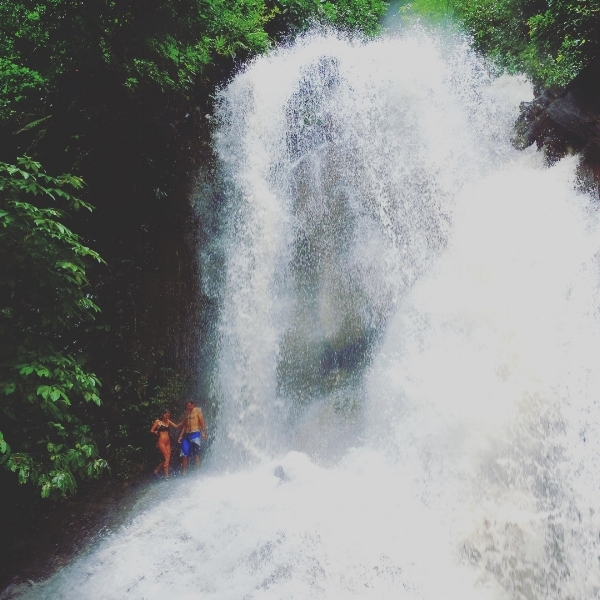 Kashi Falls is a 30 minute ride or drive down some back roads and through a large Lisu community. The Lisu are a largely Christian minority group residing largely in Northern Shan and Yunnan in China. Outside of the village, we ride to a trailhead, which starts off through a terraced rice paddy field and then hits a small river that we hike up, jumping from boulder to boulder, trying to keep our feet dry along the hike. The hike is not long, and we shortly arrive at Kashi Falls, a single waterfall surrounded by a horseshoe of cliffs. Its a very secluded and private waterfall, with only access through the river hike. 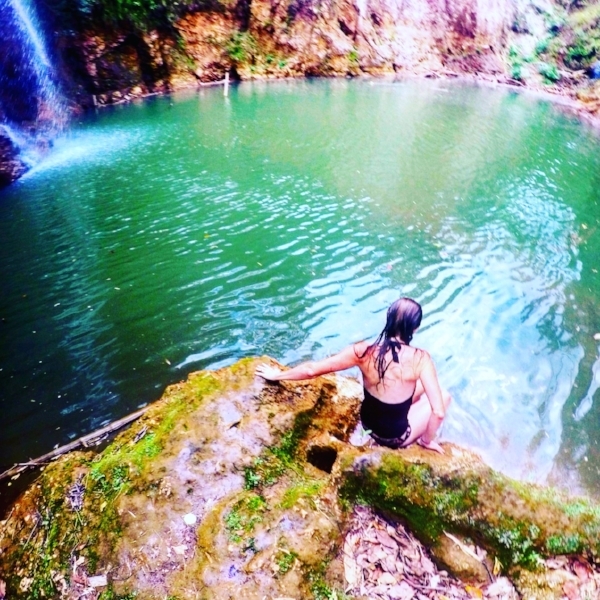 Its a perfect pool for swimming, climbing in the waterfall and jumping off the 10' (3m) cliffs. After a swim nearing the heat of the day, we will have a picnic lunch before hiking out of the falls and riding or driving back to Lashio.